As a Taurus, I’m familiar with stubbornly banging my head against a wall, but with age I’m slowly learning to seek other routes or more creative solutions. Hope this day finds you all well and not being too stubborn! Message: We always have the choice to press ahead, and Rhino Spirit’s strength offers you the power to break through stubborn obstacles. This animal spirit knows there is more than one way to open a path to what you seek. 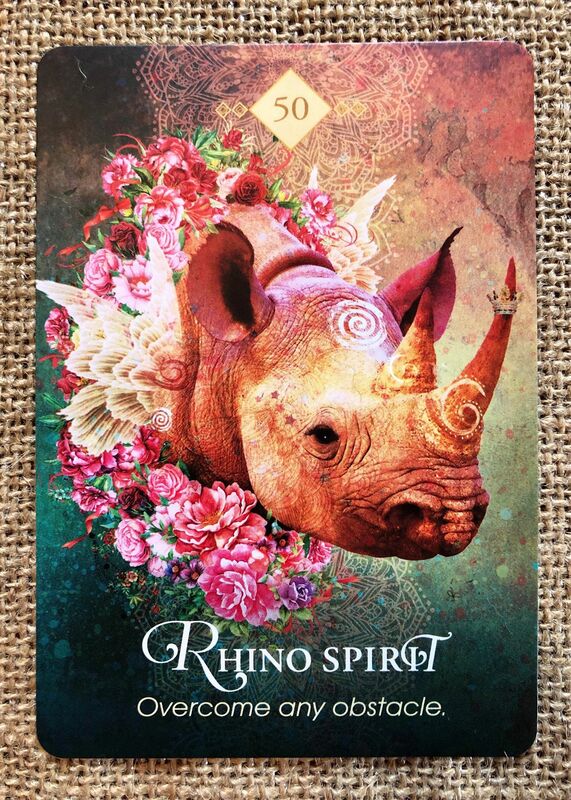 When Rhino appears, you are reminded that you have the ability to overcome obstacles in multiple ways – by going around them, shattering them with the force of clear deliberate intentions, or even transforming them into clouds that drift away by refusing to allow them to limit you. Apply your Rhino Spirit with creativity and no obstacle can stand, for you have magic to make and many ways in which to make it. Your power is awesome right now. Rhino also wants to remind you that when an obstacle appears to prevent you from getting what you desire today, it means that something much better is coming. Keep this in mind when you consider the nature of the obstacle in front of you now. Great Spirit loves you so much and only wants the best for you. Open to new possibilities, and you will find other options begin to appear. Not every conflict is worth engaging in and not every obstacle is worth resisting head-on. Don’t waste energy banging your head against the wall. Truly feels like the cards are telling us to prepare for the new year! Here’s another one that’s also good for the winter. It is a great time to take care of things in your home that need addressing and in your mind and soul. Meaning: Take time for contemplation. Turn within. Connect with your ancestors. Incubate ideas. Mend relationships. Watch your dreams and meditate. The answers are inside you waiting to be heard. Stay warm. Create dreams for your future. Repair whatever is broken in your home and your life. Forgive those people and situations that you’ve been dragging around for a while. Native Spirit Wisdom: In the medicine wheel, the north is the direction that symbolizes the darkest time of night, the coldest part of winter, the dark of the moon. It also represents the elder time of life and even a time of endings. 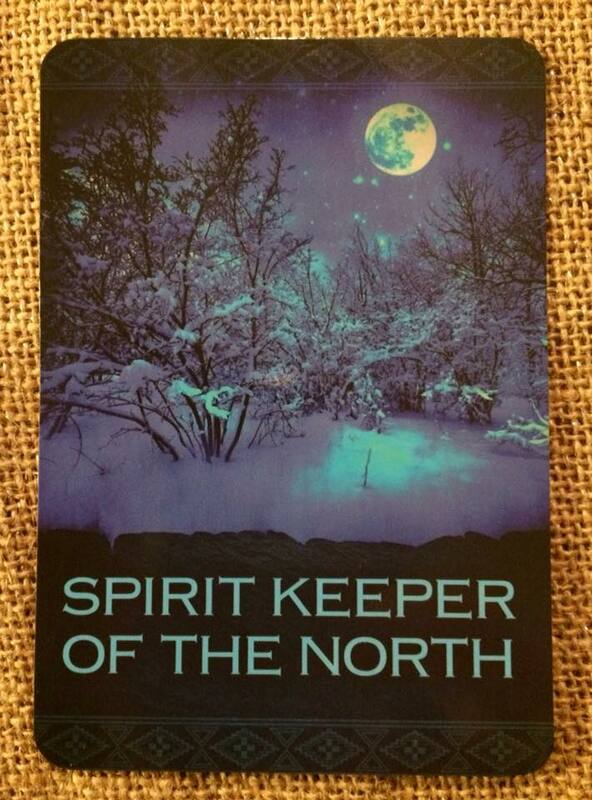 Pulling the Spirit Keeper of the North indicates that it’s time to take measure of your life. Explore what’s working and what’s not working. What and whom do you need to release? It’s also the time to make repairs in your physical environment, as well as make repairs to your body. Additionally, this is the time to begin to dream and make plans regarding your future. Your ancestors are close at this time; call on them. They want to help you. The Journey: Stand outdoors at night, facing north. Inhale the darkness. Sink into your own depth. In the stillness, ancient wisdom emerges. I hope everyone is recuperating from the holidays (if celebrated) and snug for winter. Our weather took a dip for the chilly last night after a couple weeks of 50s and 60s, so it’s playing the Trickster right now. 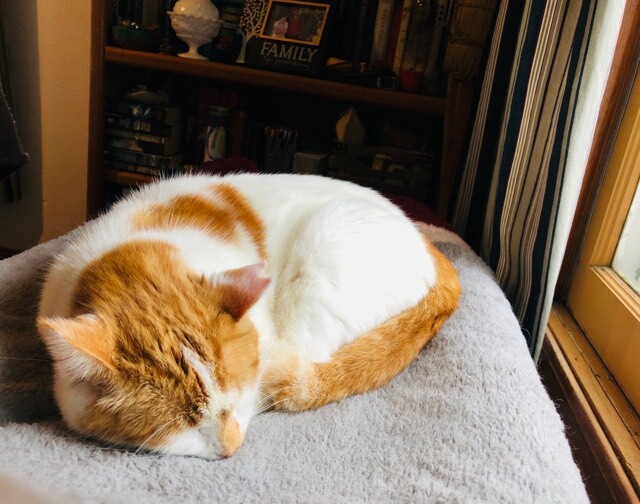 Even Tarot Kitty Budge is too snug on his blanket to stir for the card reading (meanwhile, Cerridwen the Kitten is trying to help us undecorate the tree). Been a while since we have been visited by the Trickster, but he’s not the bad fellow everyone thinks. Sometimes we need our routine shaken up in order to grow. So read with an open mind. Blessings! 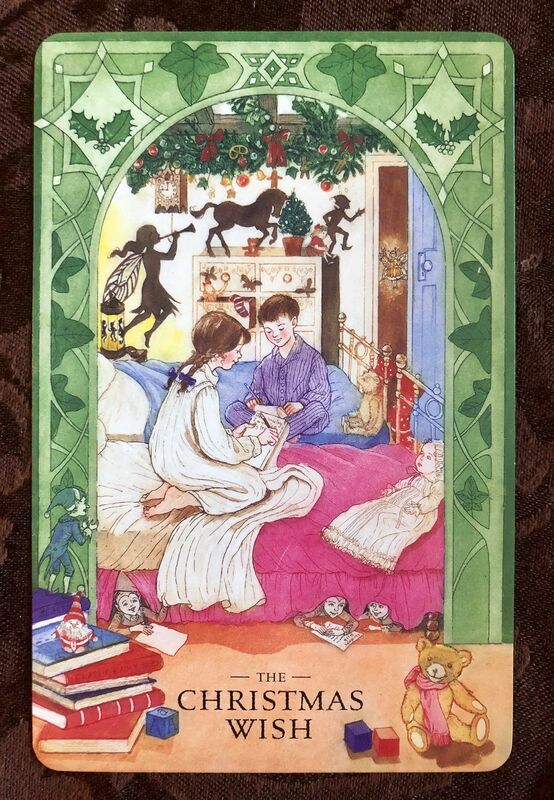 Card Meaning: Things are not as bad as they seem. Something that seems bad may in fact be good and vice versa. Don’t take everything at face value. Look beneath the surface. This card encourages you to try to find humor or gentle amusement in seemingly difficult situations. It also encourages you to have irrepressible fun. Step out of the mold. Native Spirit Wisdom: In indigenous traditions, there is the concept of the tricksters. 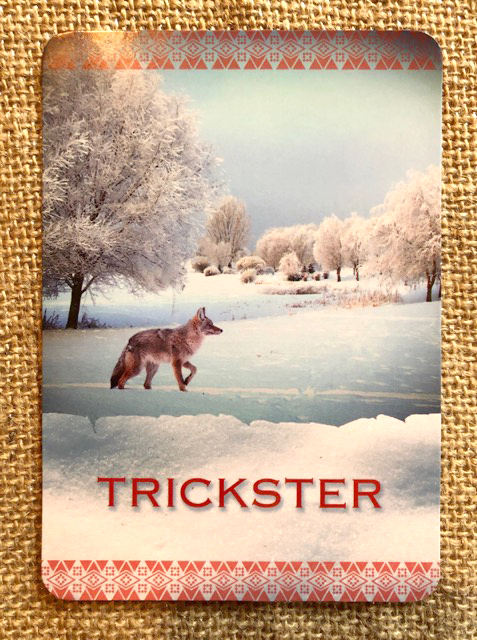 In Native American traditions, the trickster is often depicted as a wily coyote, but sometimes the trickster is a human, called “heyoka.” There is a lighthearted, fun aspect of the trickster, but there’s also the caution to tread carefully because things are not always as they seem. Be discerning. What appears to be a good opportunity may, in fact, not be. The wonderful aspect of this card choosing you is that it offers the opportunity to step out of the old, outmoded ways of perceiving yourself. The trickster allows you to see yourself in an entirely new way and asks you to step out of the older routines and habits that might be keeping you stagnant. The Journey: It might sound very strange, but the easiest way to activate the energy of this card is to howl like a coyote. If you can, it’s even better to do it during the light of the full moon. This breaks up stagnant energies and brings in fresh vitality. This is a great card as we head into the New Year. Our own home is filled to the brim as a tiny home for 3 people and 6 animals, but I’m sure there are some things we all need to learn to let go of. Sometimes taking a walk around your home and looking at all your things carefully can reveal how much stuff that you keep because you “should” or just plain forgot about. One thing I know: A good decluttering can bring as much good energy into a home as smudging and blessing it. Message: Frog Spirit knows that while all the other frogs are croaking away, this is a time for you to simplify and declutter your life so you can feel content on your own lily pad. Even when life isn’t creating a total cacophony, we can become drawn to the excitement of lots of noise. Then, the next thing we know, our schedules and homes are cluttered with commitments we regret making and objects taking up valuable space. Even relationships need decluttering, as they often become messy. 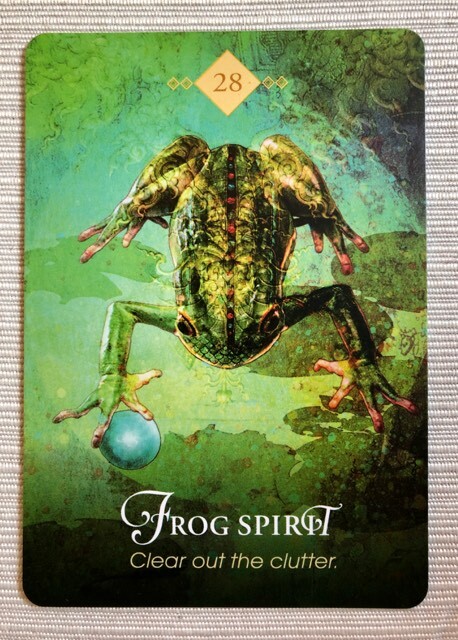 Frog Spirit appears to tell you to clean house – prioritize what you need, and get rid of or give away the rest, so you can have some space in your day and in your heart. You don’t need the old stuff and its stories shouting at you about the past. Along with the physical clutter, friendships are sometimes kept long past their expiration date, weighing you down with unnecessary baggage. Now is the time to let go. Whatever you need will appear when you need it, so relax your grip on all that clutter that is making you feel anxious and burdened. Frog wants you to reclaim your space unencumbered by shoulds, oughts, and could-have-beens. Let go and jump – you are free from all that old stuff! Protection Message: What’s weigh you down? Is it time for a spiritual and psychic cleansing? are you overdue for letting go of the voices that surround you? They may have started to get into your head, these voices that bog you down and keep you from leaping forward into a better situation. Let others croak and create their dramas while you make space for yourself and for sharing your own thoughts as they arise. Declutter your schedule and stop trying to do it all and then some. Let others manage their own baggage rather than allowing it to be dumped on you, for your lily pads needs to be clear of others’ clutter. Frog may also come bearing a message about your physical space. Do you hold on to things because you are afraid of losing your energetic connection to the past, to people who are no longer in your life, or to goals you never pursued? Or could you have these items around because you would feel guilty if you got rid of them? Are your storage and living spaces stuffed with reminders of what you are not, when they should be holding only objects that reflect who you are and aspire to be? If something is no longer making you feel joyful, empowered, and excited, Frog is telling you to let it go and free yourself to leap forward into something new, trusting you will always have what you need. Good Wednesday! I hope everyone has come through the December holidays OK and each you found our own joys. My Sweetheart gifted me a new oracle deck, and it’s gorgeous. Of course, I had to give it a go this morning. It’s the Spirit Animal Oracle by author Colette Baron-Reid and artist Jena DellaGrottaglia. Here’s the cover and a few sample cards if you’re curious. Message: When Porcupine Spirit calls your name, you are being asked to adopt a beginner’s mind and to approach situations with innocence and curiosity – the old, confining stories no longer have a hold on. you. Life is full of surprises hiding in plain sight. Looking at the world afresh, with new eyes, can help you find what you have been seeking, whether it is a relationship, an opportunity, or evidence that you have all you need right now to co-create what you desire. Who knew? 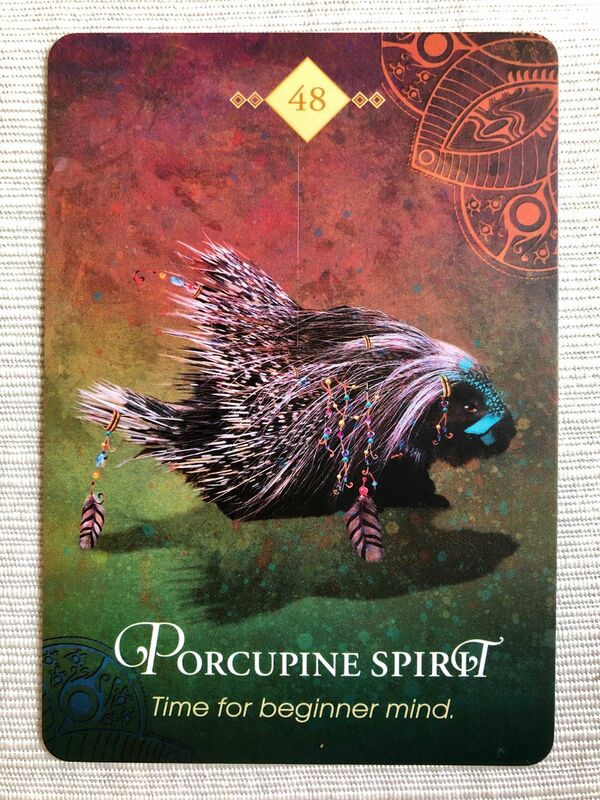 Porcupine asks you to be playful and have a childlike curiosity. There is so much waiting for you that you have yet to discover! Protection Message: Are you feeling prickly and defensive lately, and assuming you will be hurt before you have seen any sign that such a reaction is called for? perhaps an old sense of guilt and shame is causing you to be cynical and wary when you are meant to be open and curious. Self-protection is a good thing, but you may be protecting yourself from something that will not actually harm you but instead will bring you abundance, happiness, and love. Remember your innocence, and you will see what you have been overlooking. Porcupine quills are filled with air, allowing a porcupine to float in water. Now is a time to let your innocent nature keep you buoyant. This is a sweet and warm card, but it also brings a reminder not to fall into a materialistic trap. What does it say to you? It’s a tradition generations old – making a Christmas wish list for Santa. What I love here is that, as the children carry on this tradition, there are little elves and sprites all around them listening and taking notice. Not only do they see if we’ve been “good or bad” but they can also see what we already need and have. As we make our wishes this holiday season, it’s good to remember what we already have and not ask for excess – or even to ask something for others who have less than they need. These children are clearly loved and cared for – they have books and toys and a warm home – and let’s hope they (and the generations being raised now) have learned to ask with a humble and appreciate heart. And to learn to see the magic around them. Blessings, everyone! This is fun-looking fellow – what is your take of Uncle Holly? 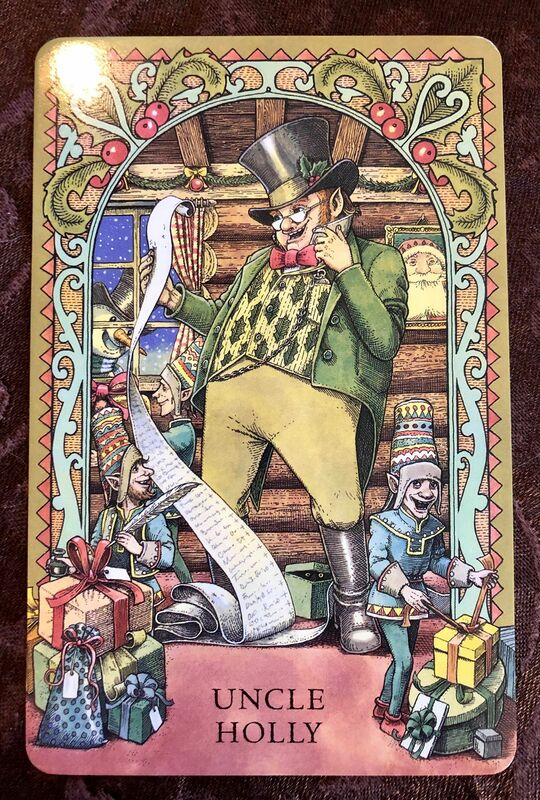 This is a jolly looking fellow who seems to be doing something very Santa-like – making a list and checking it. Uncle Holly is a character in a short play about Father Christmas and his secret twin brother (Holly). At Selfridges store in the UK around the 1950s, Uncle Holly was a character children spoke to instead of Santa (I’ve also found that he was the person they spoke to before visiting Santa’s lap). Let’s not forget that Holly, in Celtic tradition, is half of the battle for the year: The Holly King (winter) and the Oak King (Summer). Holly itself reminds us of the earth’s energy and vitality when most other plant life has gone dormant. It reminds us of hope and generosity.